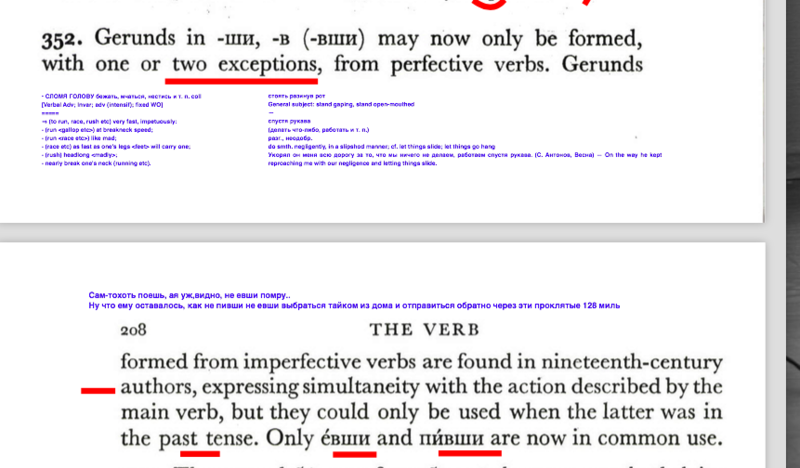 It has been confusing me the fact that a few verbs have participles which, according to textbooks, normally don't match a particular verb aspect (perfective or imperfective). For example, гореть (imp.) and сгореть (pf.). The past passive participle is normally formed from the perfective aspect, however the word горелый exists. Another example is резать (imp. ), разрезать (pf.). According to some dictionaries, the word резанный exists. Apparently there are also past adverbs for imperfective verbs, like ждав instead of подождав, according to cooljugator.com. So, how far can we use past participles and past adverbs with imperfective verbs? [C]традательные причастия могут образовываться только от переходных глаголов. Причастия страдательного залога прошедшего времени образуются с помощью суффиксов -нн- (от глаголов на -ать: читанный, потерянный), -енн- (от глаголов на -ить и -чь: испеченный), -т- (от односложных глаголов: мятый). Также не от всех глаголов образуются в русском языке страдательные причастия прошедшего времени. Этот телефон у меня уже сто раз терянный и найденный - This phone of mine has already been about a dozen times lost and found. У меня огород 2 года стоит не копанный - My veggie garden has for 2 years gone non-spaded. 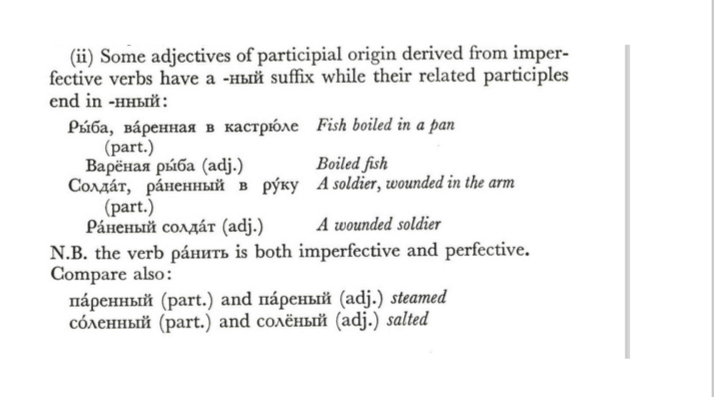 Considering the statement according to which past passive participles derive from transitive verbs and the list of suffixes pertaining to past participles, it appears that words formed with the suffix - л- (горелый, спелый, прелый, лежалый, вялый) can't be classed as participles. 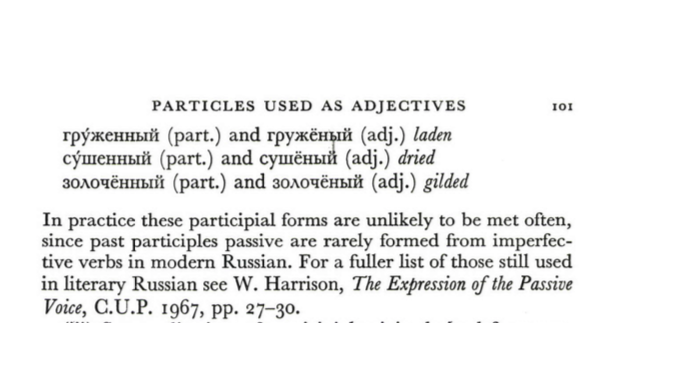 I think they're adjectives, however indeed their link to intransitive verbs is apparent: гнилой - гнить, умелый - уметь, усталый - устать, отсталый - отстать, запоздалый - запоздать, беглый - бегать, талый - таять, светлый - светить (here the quality is ascribed not to the subject but to the object despite incongruence with the verb's character), and even смелый i believe is linked to сметь. Strangely i've managed to find only one site where they're mentioned and there they're listed as adjectives. Прилагательные, образованные от глаголов, с суффиксом –л-. Например: обнищалый, опустелый, прошлый. According to some dictionaries, the word резанный exists. Ждав must be archaic and sounds awkward by modern standards. In modern language ожидая will be rather used instead. However it's no substitute for подождав due to aspect difference. Both have their use. So imperfective past adverbs derive from imperfective verbs by appendage of the -(а)я suffix and are very much in use. Not the answer you're looking for? Browse other questions tagged глаголы вид наречия verb-aspects or ask your own question. How to remember the differences between all of the “-гляд-” verbs? What is the correct perfective partner for курить? Why are there verbs derived from ходить, but not идти? Are “тянуть” and “растягивать” equivalent?